Check it folks. 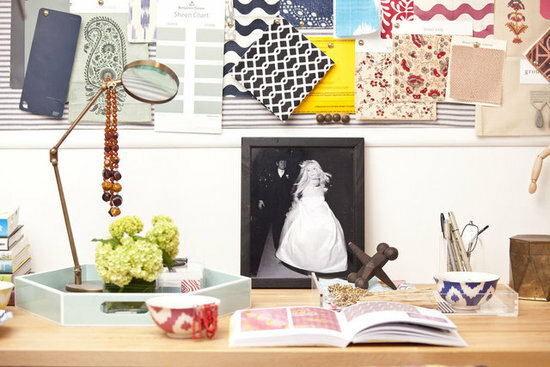 You may have heard about Elle Decor's Bloggers Choice: 8 awesome guys and gals that are shaping the design world of 2012. Among the nominees? Some fun faces like Jenny Komenda from Little Green Notebook, and a new face (at least for me), Amber Lewis from Amber Interiors. I checked her out and added her blog to my daily read list on google reader (totally useful way to house all your blog lists in one place). And then...and then. Casa Sugar did a little house tour of her 1960's California ranch-style home, and well, frankly her integration of textiles, patterns, and divergent styles totally blew me away. Her style is like a comfortable bohemian oasis. Amber's background is in textiles, and it shows in her playful mixing of patterns, colors and textures. So--check out these amazing images from Casa Sugar's house tour! This living room is textile and pattern heavy, but also with a laid back and relaxed vibe. Your eye is immediately drawn to the Suzani ottoman which is really the focal point of the room, and also the center point. The mix of patterns are all colors and elements drawn from the ottoman: the black and white in the rug, the light white ikat seat cushion pillows, the red throw pillows, even the grey in the throw. These patterns and colors all work together so well because they are drawn from one piece that is the center point of the room, both physically and palette wise. 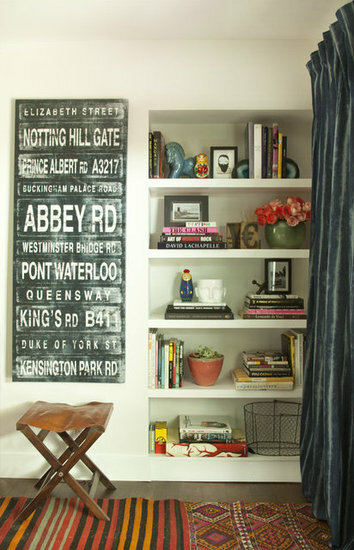 You can make the most of built-in shelving by artfully displaying a collection of books, vessels, pictures, and objects. These shelves aren't overly accessorized or cluttered which is not exactly an easy feat. Also notice that the most visually intriguing objects are positioned at eye level. You should always incorporate your favorite elements where you will see them the most. Storage boxes and such are very useful of course, but put them up high or down low; they aren't essential elements contributing to the overall aesthetic of the shelving. Amber has a seriously incredible collection of rich kilims that I am ridiculously envious of. Especially since I don't have any rugs. And even more so because I have carpeting in the bedroom when I am a die hard wood floors kind of gal. 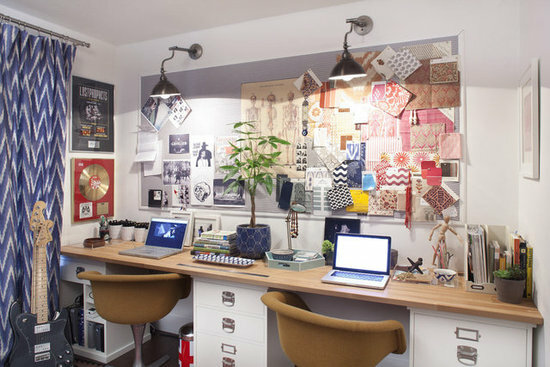 Office space that is shared with her husband: I love the dual desks and subtle differences in decor that allow you to differentiate each person's space. The sconces are a nice touch that add overhead lighting to the room. The desk itself is built on file cabinets that provide storage for unsightly objects and papers. 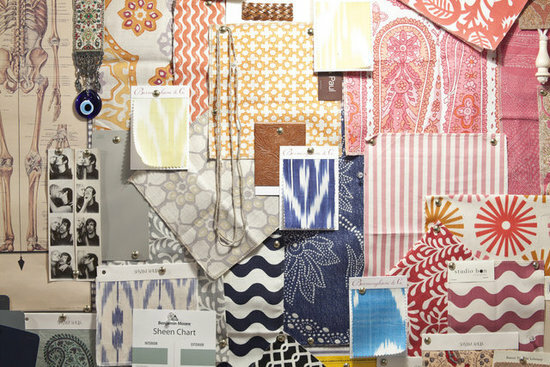 I love the chevron printed curtains, as well as the giant fabric board for inspiration. Foliage is always a nice natural touch, and the patterned pot is really unique. Close up of Amber's desk: a great black and white photo, trays to corral odds and ends, a textile book for inspiration, bowls and containers for objects and pens, etc. A great example of Amber's eye--lots of different patterns here arranged mostly by color, yet they are all distinctive patterns that are paired together so well. 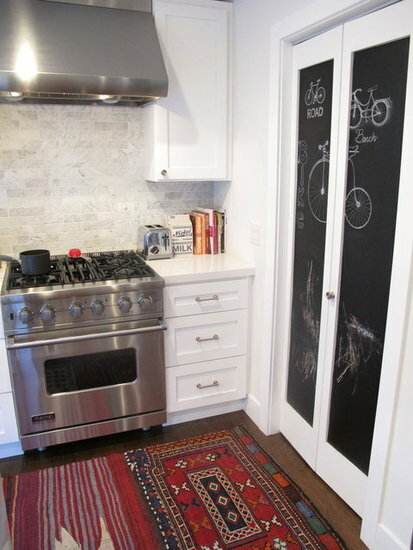 The kitchen--blackboard walls and closets are popping up everywhere, and I have to say, it's a trend I am LOVING. It's a fun and punchy element that's rather unexpected and highly customizable. Oh, these patterns! I can't get enough! 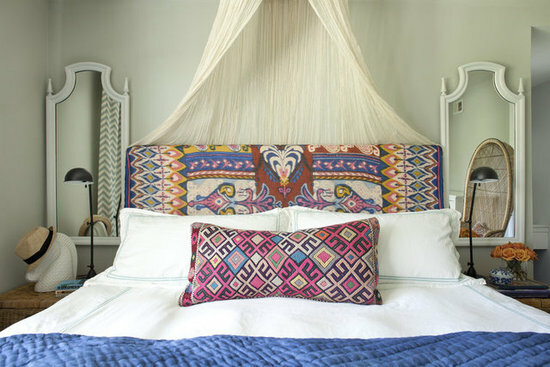 So dig this: that patterned headboard? It's a scarf, and wait for it: $17 from H&M. Doesn't that just KILL you?! Amber Lewis, I have SERIOUS shopper's envy of you right now! And what a fun way to just change things up, throwing a pretty patterned scarf over your headboard. I love this idea, considering I like to change my decor as often as I change my jewelry (read: a lot!). And again, with the mixing patterns, the bold pink kilim throw, the chevron curtains, the diamond patterned rug (layered! )...it's a lot of different elements going on but they all work so well together. The rattan campaign nightstands are a great relaxed vibe and complement the pair of stools at the foot of the bed. There's something to be said for artful symmetry. 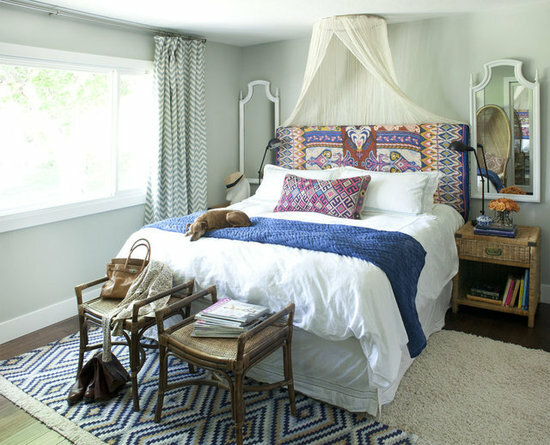 What do you think about this relaxed boho socal vibe? And MAN, don't you wish you'd been at H&M that day? ?